Welcome to your January propertybuyer market update. 2012 is set to be a year of recovery and consolidation for most Australia property markets. Some areas will enjoy solid growth driven by latent demand or resource drivers while other areas will languish. Australian Property Monitors (APM) noted that national median house prices were down by 4.2% but are predicted to rise by 3% to 5% in 2012. Sydney's median house price only declined -0.9% last year compared to -3.1% in Brisbane, -1.2% in Melbourne, -2.2% in Perth, -1.4% in Adelaide and -3.5% in Darwin. Rismark International recorded a very small 0.1% increase in national house prices in November which is signaling a projected rebound in property prices. The national economy is set to grow strongly on the back of mining and resources sector. Treasury estimates are for around 3% to 4% growth in GDP (much to the envy of the developed world). Immigration is likely to increase as the demand for skilled workers intensifies from economic growth. This will flow onto increased housing demand. The prestige market will continue to struggle to gain traction. With a subdued sharemarket, the level of executive bonuses is limited and buyers are cherry picking the stock that is available at the top end of the market. Affordability will continue to be an issue for households on average incomes. However, interest rates are likely to decline in the first quarter of this year which will improve market confidence and turnover. I'm tipping around a 0.5% reduction in rates this year. Sydney's median house price is likely to increase by around 5% this year spurred on by the chronic undersupply situation and extremely tight rental vacancies. Expect rents to continue to rise and confidence to resume once lower interest rates filters though the state economy. Perth is also likely to experience solid price growth created by the record levels of investment in the resources sector. APM predict growth of 5% to 10% on back of low construction levels and a flood of new workers chasing higher paying jobs in the mining sector in WA. Melbourne is likely to go sideways in terms of price growth in 2012 following several years of strong price growth and large numbers of new apartments entering the market. Its median house price at $533,000 is just $100k behind Sydney at $643,000. APM expect price growth of 0% to 3%. Brisbane this time last year was under water with the devastating floods. Key price drivers include interstate migration, reconstruction programs and the massive resource sector investments in regional areas should see solid price growth in Brisbane of over 5%. Adelaide is a bit like a lady in waiting for the resource sector investment to really take effect. The announcement of the Olympic Dam site expansion augurs well for potential growth in Adelaide and surrounds. APM predict growth of up to 3%. Darwin has solid prospects for capital growth due to a significant housing undersupply, but is a much more volatile market due to the seasonal nature of employment patterns with its defence and resources sector industries. APM predict growth of 5-10%. Over the last 11 years as a Buyers Agent, and being involved with over 1000 transactions, I have seen an incredibly wide range of transactions and emotions that go with each purchase. 1. Active Buyers - these buyers have a positive self image, take the initiative and seek out best deals by researching extensively. They are regularly looking at their financial position and willing to calculate the returns and mitigate the risks. They have a plan and end goal with their property investing. They expect the property to perform well and review the rents at least yearly. They are usually time poor leveraging the search function out to a buyers' agent. As soon as they have some equity or additional cash they are looking to expand their portfolio. 2. Reactive Buyers - these buyers take action only when prompted and realise often too late that to achieve their financial goals they should have started 5 years ago. Reactive buyers often suffer from "paralysis of analysis" and try to gather up so much information that they end up getting confused. The reactive buyers need reliable information to make decisions but take a long time to get their act together. They might respond to a special offer and think that just buying one or two investment properties will get them to financial freedom rather then embarking on a specific plan. 3. Passive Buyers - these buyers sit on sidelines and watch others make money, thinking they should do something but lack the motivation to get going. They are less trusting of others and need proof that property investing actually works. They fear failure and therefore procrastinate rather than taking action. They are wary of real estate agents and believe the world is full of sharks ready to devour them. They are very frugal with money but still want to achieve financial security. What are your personal property goals for 2012 and beyond? Do you want to create a portfolio of 10 properties that pays you $120,000 pa and provides you financial freedom? Perhaps you haven't really set a goal yet or perhaps it's something you'll get around to later because it seems like too much hard work to research the right kind of properties. The reality is that to achieve any worthwhile goal you have to set and be committed to a plan. We would love to help you create and achieve that plan and work with you to build a portfolio of high growth and positive cashflow properties that makes your wealth creation goals a reality. In buying a home or investment property, you are likely to encounter a whole range of emotional highs and lows. 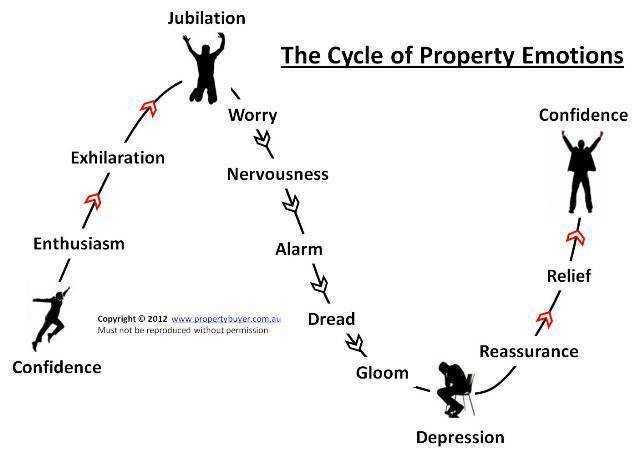 I have developed a "Cycle of Property Emotions™". When starting out I see buyers full of optimism and confidence and with high expectations of finding the perfect home or deal of the decade. The buyer approaches the search with enthusiasm believing that the search will show up hundreds of excellent properties. One is found, bought and the champagne is popped for the celebrations (jubilation!). However, buyers remorse and worry soon kicks in when the buyer discovers a few cracks in the wall (or the tenant missed a weeks rent). You start to get nervous and have a few restless nights wishing you had done more due diligence before signing the contract. You become alarmed when reading a negative media article that suggests there is a property bubble and prices are 40% over valued. This gives way to dread and panic starts to set in as you think "perhaps I really have made a terrible mistake and should have stuck my money under the mattress." Depression overcomes you when you consider how long it took to save up the deposit. Shadows of gloom appear when you remember you have to explain yourself to your accountant in July. But then the market begins to turn, some positive stories come out, interest rates drop a little and the future is looking bright again. This gives way to relief that you didn't sell the property prematurely and holding for the long term was OK and provides the confidence to buy once again. Whatever stage of the property buying cycle you are at, be aware of the range of emotions that you are likely to experience. Consider your overall strategy and don't be reactive to something that can be managed, like a bad tenant. It's important to manage your emotions during the buying cycle. Many of our clients have commented that they found having a buyers' agent on their side helped them ride the rollercoaster of emotions and stopped them making expensive mistakes. Discover how to rapidly grow your property portfolio like a seasoned professional investor at our next interactive webinar. Just click on this link to register your details. We have limited seats available. How to use the services of a respected property commentator and be paid by us to do so (sounds crazy but hear us out on this one). Stacey owned an investment property in the inner west and was looking to expand her portfolio. The property was bought sight unseen by her, and she was very happy with the apartment when she did see it after settlement. We purchased a top floor apartment with an open outlook and good cross-ventilation. The apartment was also rented within a week of being put on the market.